We choose to feature the softest alpaca fiber, which is known as Baby Alpaca. This does not come from the first "saddle" of a cria, which is the proper name for a Baby Alpaca, but from animals bred for the finest micron that is lovely worn next to the skin. Alpaca fiber is long, fine, and without grease. 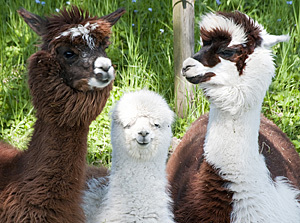 Alpaca fiber is shinier, smoother, stronger and several times warmer than wool. It is also heavier and less elastic than wool. It comes in 22 distinct colors. It is easily dyed while still retaining its natural luster. Weaver Creek Fibers is pleased to supply both Baby Suri Alpaca Top and Baby Huacaya Alpaca Top. Suri alpaca fiber is silky with a wonderful luster. It flows straight down the animal in shiny locks with very little crimp. Huacaya alpaca fiber grows out of the animal in a puffier look and has more crimp. Baby Alpaca in the past has been very difficult for hand spinners to find at a reasonable price and in the form of combed top. Baby Alpaca has an approximate micron of 22.5, which is approximately 4 microns softer than Superfine Alpaca, which leads to a much softer yarn.